Gran Turismo 5's designer Kazunori Yamauchi suggests that Polyphony Digital's flag faux pas will not delay the game any further. 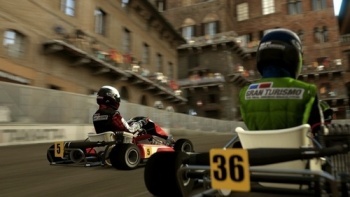 As reported over the weekend, the Italian city of Siena is angry at Sony after it was discovered that Gran Turismo 5's Piazza del Campo go-kart track used flags from the city's Palio di Siena horse race. The Consortium for the Protection of the Palio said that it had not granted permission for the use of the flags, leading to speculation that the game might need to be delayed again. But speaking on his Twitter feed, Yamauchi said that removing the flags wouldn't be a problem, and that they could be taken out in a "instant." He felt that their removal would be "regrettable," as they were part of the setting's beauty. Faced with a choice however, between removing them and having the game's release halted by a legal challenge, I'd assume Sony would go for the former. Gran Turismo 5 has been in development for over five years, and has been dogged with delays. Its release date is currently pencilled in as November 2nd in the US, and November 3rd in other territories.